The closing ceremony took place in the Korston Hotel and was attended by FIDE President Kirsan Ilyumzhinov, Minister on Affairs of Youth, Sport and Tourism of the Republic of Tatarstan Rafis Burganov, players, officials and spectators. The winners Anna Muzychuk and Humpy Koneru were awarded with big wooden chess pieces and all the participants of FIDE Grand Prix in Kazan were awarded with flowers and presents. Viktorija Cmilyte received a special prize devoted to 100 years anniversary since the birthday of Rashit Nezmetdinov. Her victory against World Champion Hou Yifan was chosen by the organizing committee as the best game. At the closing ceremony FIDE President Kirsan Ilyumzhinov has made a surprising gift for the Chess Federation of the Republic of Tatarstan - a set of electronic boards, in which participants played! Pictures from the cloisng ceremony are here. After 11 rounds Slovenian player Anna Muzychuk and Indian player Humpy Koneru became winners of the championship. According to the regulations of Grandprix in the case of any tie in any tournament, the Grand Prix ranking points and prize money will be split equally. Before the last round three players shared first place: Viktorija Cmilyte, Anna Muzychuk and Humoy Koneru. The 11th round of the tournament was an extremly tense and 5 games out of six were desicive. Humpy Koneru sacrifieced a piece and managed to defeat Alisa Galliamova with black pieces. Before the last round of FIDE Women Grand Prix in Kazan three players are on top. Viktorija Cmilyte won against Nadezhda Kosintseva and replaced Elina Danielian, who was defeated by Alisa Galliamova. Elina chose to go into a sharp position in the middle game but missed intersting opportunity on 19th move and her position became worse. Russian player Alisa Galliamova, who lost four previous games, played precisely today, neutralized all threats of her opponent and left with extra material. Other leaders Anna Muzychuk and Humpy Koneru made draws against Hou Yifan and Alexandra Kosteniuk accordingly and share first place with Viktorija Cmilyte with 6.5 points. Tatiana Kosintseva could score today playing with white against Antoaneta Stefanova but missed her chances in the time troubles. Russian, and earlier Soviet chess Grandmaster (1994), honored Russian master of sports (1999). Russian Champion (2005). 4-times World Chess Olympiads’ winner with Russian team (1996, 1998, 2000, 2002) and 2-times world champion with Russian team (1997, 2005), winner of many international tournaments . In February, 2012 was appointed to the position of the Russian women team senior coach. Anasyasiya Karlovich: Sergey, you have just arrived to Kazan from Moscow has recently staged Tal Memorial. Did you follow FIDE Women Grand Prix in Kazan? Sergey Rublevskiy: Yes, of course, I saw all the game. Kazan stage of FIDE Women Grand Prix is gradually reaching its culmination. Elina Danielian lost the first game in the tournament to Alexandra Kosteniuk. Ex-world champion, who had white pieces, was playing for initiative from the opening and found nice sacrifice to open the central files and create a decisive attack on opponents ‘king. The defeat of Armenian player let Anna Muzychuk, who made a draw against Viktorija Chmilyte, and Humpy Koneru, who won against Katerina Lahno, reach her on top. Although two rounds to go there are three leaders in the tournament. Hou Yifan managed to win in close to draw rook endgame against Alisa Galliamova. After the 5 hours of play Antoaneta Stefanova got winning chances in the bishop endgame against Betul Yildiz but didn’t find the way to create more problems for her opponent and as a result the game was drawn. Quite predictably, Kosintseva sisters concluded a draw. It took them 14 moves this time to seal their usual result. Viktorija Čmilytė (born on August 6, 1983 in Šiauliai) is a Lithuanian chess player with the titles of Woman Grandmaster (WGM) and Grandmaster (GM). She is the winner of the Women's European Individual Chess Championship in 2011 (Tbilisi). She is a former two-time national champion. In team chess, she has represented Lithuania at most of the major events and is an Olympiad double gold medal winner. After eighth round share 3rd place with Humpy Koneru. Chess players are considered to be serious and boring, like “Shurik” from famous Soviet comedy (smiling). It may sound commonplace, though I believe chess players to be smart and not so much serious, they can be either emancipated or merry, like normal folk. Four games in the eighth round in FIDE Women Grand Prix in Kazan were decisive today but in fact all of them could be scored if Betul Yildiz and Viktorija Cmilyte, who had big advantage, would defeat their opponents - sisters Nadezhda and Tatiana Kosintsevas. The central game of the match between the leader Elina Danielian and chaser Katerina Lahno finished in favor of Armenian player. Anna Muzychuk got a better position after the opening in the game against Alisa Galliamova but later on didn’t play precisely and allowed black to equalize. In the deep endgame Slovenian player managed to find winning chances and beat her opponent. World Champion Hou Yifan, who played white against Alexandra Kosteniuk, sacrificed the second knight on g7 square in this tournament as it also happened in the game with Antoaneta Stefanova in the sixth round. The attack of Chinese player was decisive and Alexandra could not defend her position. 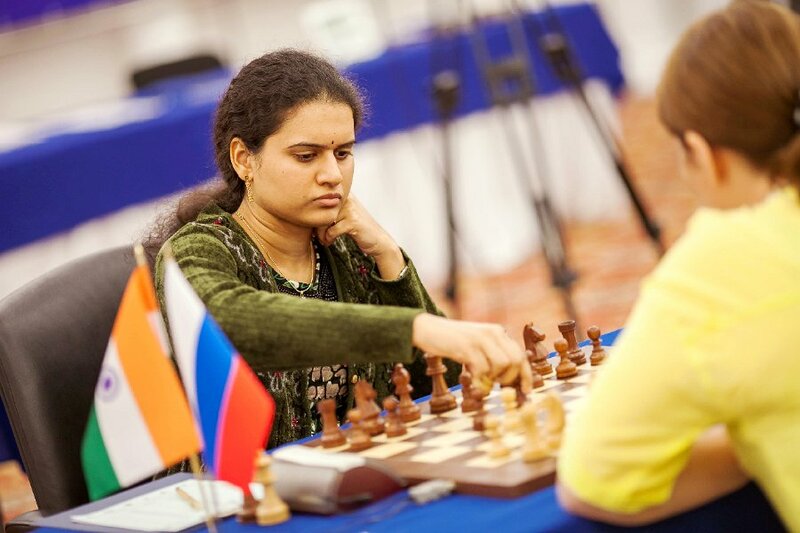 Humpy Koneru created strong initiative in the middle game and defeated Antoaneta Stefanova. Elina Danielian made a draw today in the game against Antoaneta Stefanova and keeps leading after the 7th round of FIDE Grand Prix in Kazan. Bulgarian player got slightly better position in the middle game but didn’t use all the chances although Armenian player found precise way to defend in the deep endgame. Katerina Lahno could have joined Elina Danielian on top but missed the winning possibilities in the game against world champion Hou Yifan. Anna Muzychuk drew against Tatiana Kosintseva and keeps sharing the second place. Viktorija Cmilyte defeated Betul Yildiz and caught Anna Muzychuk and Katerina Lahno. Nadezhda Kosintseva didn’t receive any advantage in the opening playing with white against Humpy Koneru and later on players agreed for a draw in the pawn endgame. Alexandra Kosteniuk found good chances to fight for advantage in the complicated game against Alisa Galliamova and succeeded to win.